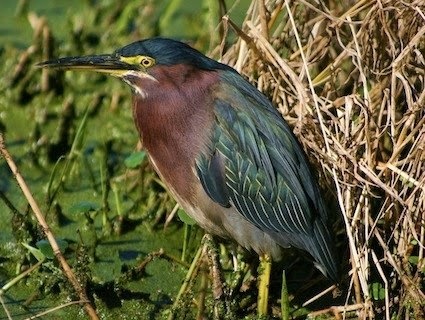 This month, we have been fortunate to see a Green Heron on the pond at the Inn on Mill Creek B&B. This is the first year that we’ve seen one, although that doesn’t mean they haven’t been here before…we just never noticed! 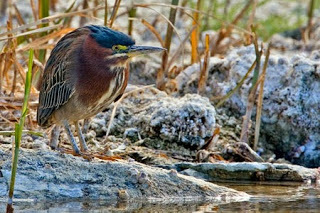 So now that we have taken notice, this beautiful bird is getting the May 2015 spot in our 12 Months of Birding at the Inn series on the blog. The Green Heron is one of the world’s few tool-using bird species. It creates fishing lures with bread crusts, insects, earthworms, twigs,feathers, and other objects, dropping them on the surface of the water to entice small fish. 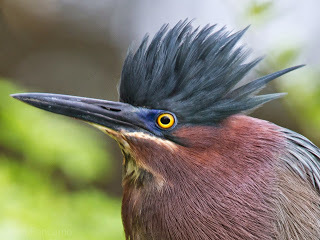 What we like about the Green Heron is that even though it has a generally sleek appearance, the feathers on its head will sometimes stick up, giving it a “bed head” look, almost like Kramer off of Seinfeld. Seriously. The Green Heron is a summertime visitor to our area, migrating north in the springtime and heading back home to its southerly abode sometime around August.